Press Release from Cliff™ Electronics, 3rd May 2018. XRP Recess Plate in XLR shell. 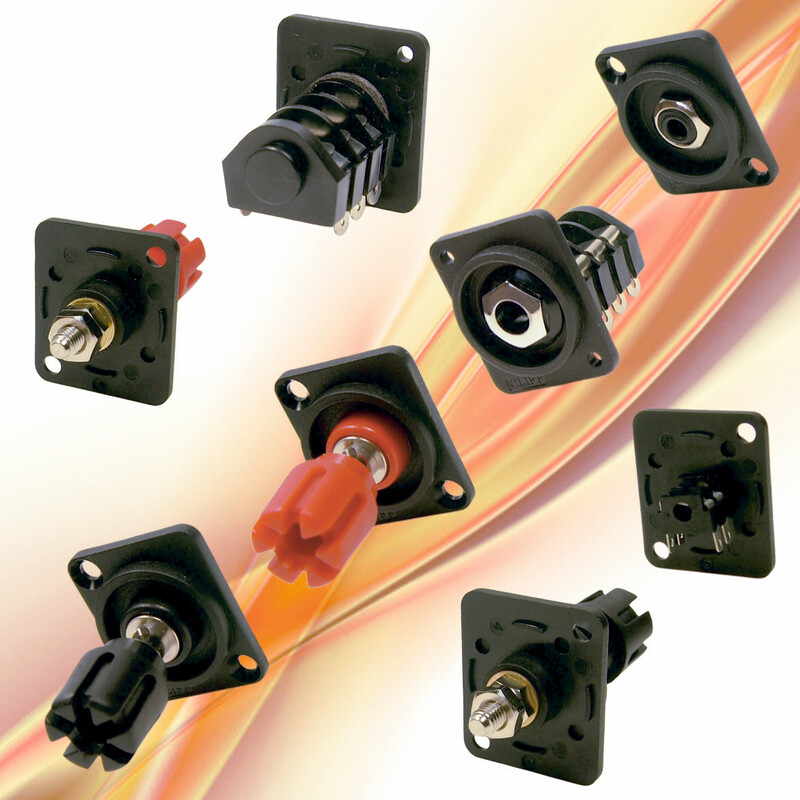 Cliff™ Electronics’ successful range of 24mm-diameter, XLR-panel cut-out connectors has been further extended to include jack sockets and high current terminal posts. XLR-sized connectors are widely used in audio and broadcast systems and are increasingly popular in instrumentation, medical and industrial products due their flexibility, security and reliability. Using the standard XLR-chassis-panel cut-out, Cliff™’s wide range of standard and feedthrough connectors can be mounted on control panels with the same hole for every connector required. This simplifies panel design and allows connectors to be mixed-and-matched during assembly as per individual system requirements. The new jack sockets are available as either 3.5mm mono or 6.35mm (¼″) stereo. Both models feature plug-operated switching contacts and solder-tag connections. The TP6 single terminal binding posts are available in red and black and intended for high current applications up to 30A. They incorporate top and cross connecting holes with a diameter of 4mm. They are connected to the system via a threaded spindle and are flammability rated to UL94HB. The new Cliff™ jack sockets and terminal posts may be ordered with either a 3.5mm countersunk mounting hole or a 2.5mm plain mounting hole. The Cliff™ XLR-format, feedthrough connector range allows designers to simply integrate audio, video, digital, optical, networking and data feeds into professional equipment for broadcast, lighting, audio, instrumentation and industrial applications. Available versions include RJ45, HDMI, BNC and USB3.0 compliant single and dual versions. Analogue, digital and optical feedthrough connectivity is available in formats including Firewire, HDMI A-to-A and 50 ohm BNC versions, USB2 A-to-B and B-to-A changer sockets and USB3 to USB3 in various configurations. Also available are popular data and ethernet connectors including LC and SC fibre,fiber, (Duplex and Simplex), UTP and FTP RJ45s in both Cat6 and Cat5e, (shielded and unshielded), TOSLINK and RCA phono.phono/cinch. John Hall, Managing Director of Cliff™ Electronics, comments; “StandardisingStandardizing on the XLR-mounting footprint allows system integrators a wide range of standard and feedthough connectors from Cliff™, simplifying panel design and improving product aesthetics.esthetics. Our XLR connector range continues to grow and find new applications and we are always looking for new options to develop.”. 1U 19″ rack panels, pre-assembled with up to 16 feedthrough connectors are now available to order, offering systems integrators simple system assembly, reduced manufacturing time, component count and cost. Cliff™ Electronics are market leaders in the design, development and manufacture of connectors, leads, test lead sets and accessories for a wide range of markets. They supply major international manufacturers. As a UK manufacturer, Cliff™ is able to respond quickly to customer needs for both standard products and custom designs. Cliff™ manufactures audio, optical and power connectors and accessories, general industrial connectors, foot pedals, lighting connectors, terminal posts and connection blocks, motors, fans and assembly aids. Cliff™ can also provide a wide range of leads including test and instrumentation, audio, instrument and power. All versions of Cliff™ XLR-footprint connectors are in full production and available direct or via major worldwide distributors. Cliff™ Electronic Components Limited was founded in 1977 to supply the music industry with connectors. Cliff™ has subsequently greatly expanded its’ products and services to become a high quality supplier to most professional and industrial markets. As both a manufacturer and a distributor, the expansion of its’ product range has established Cliff™ as a prime source for components. As a UK manufacturer, Cliff™ is able to respond quickly to customer’s needs for both standard products and custom designs. Cliff™ manufactures audio, optical and power connectors and accessories, general industrial connectors, foot pedals, lighting connectors, terminal posts, connection blocks, motors, fans and assembly aids. It can also provide a wide range of leads including audio, instrument and power. Cliff™ has extensive expertise in moulding molding and metalwork. It can provide a design, engineering and manufacturing service for the production of customised customized components and assemblies. Plastics expertise includes injection-moulding injection-molding, blow-moulding blow-molding, extrusion, sonic-welding and printing. Metalwork includes stamping, machining, aluminium aluminum extrusion, finishing and printing. Cliff™ has the facility to enable assembly, inspection and testing. Cliff™’s UK and Far Eastern production plants are certified to ISO9001 and employ design, engineering, technical, marketing and sales personnel. Quality has always been of prime importance and the majority of Cliff™ products are covered by approvals from organisations organizations such as UL and VDE.